Great news for BlogrCart e-commerce template for Blogger (Blogspot). As of 6th May 2014, 0230 (+8.00 GMT), sponsorship text and link for the send email orders from your FREE and PRO send order email have been removed. It will be a sad departure for us, as the sponsorship had really boosted the BlogrCart template brand and development, financial speaking. But good news for BlogCart template for blogger users, as with this sponsor removal, now your send order e-mails will not display the "Sponsored by" link at the footer of your users send order e-mail copy. The red indicator has been removed in the Send Order email notification. 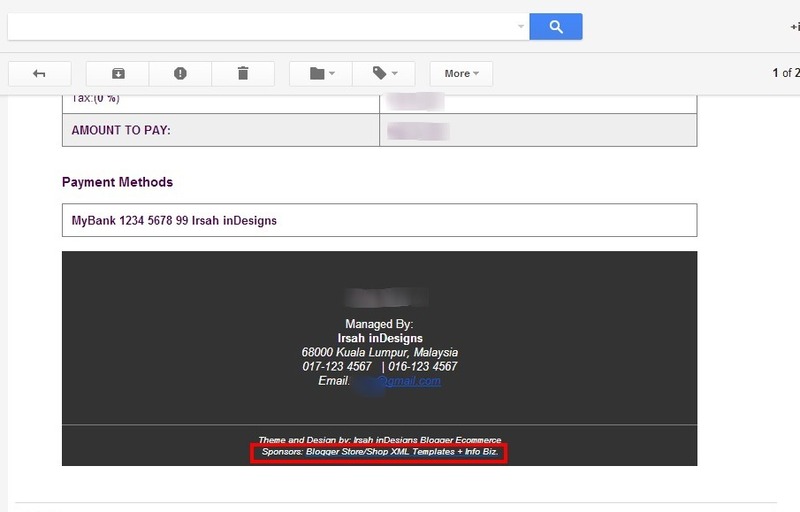 Example email here from BlogrCart Template 2014 release. With the "sponsor by" removal, it will definitely help you brand your Blogger on-line store, and now it will entirely focus on the information sent, which is the store orders and preferences. Unfortunately for our PREMIUM users, the "Sponsor by" removal will be executed at a schedule date. This will allow us to compensate the remaining sponsor "timeline" required for our sponsors. But the good news, the removal link (for PREMIUM users) in their send order emails will be finalised before 01 June 2014. We hope that this update will help you brand your Blogger store and for our sponsors, we here, the team members of Irsah inDesigns really can not make it without your support and guidance. FREE Users - Blogger store owner/user who are using Irsah inDesigns free template downloads with credit links attached. PRO Users - Blogger store owner/user who have a copy of Irsah inDesigns PRO BlogrCart templates with NO attribution link on template, holding a license/permission. PREMIUM Users - Blogger store owner/user who have a customize Blogger e-commerce template, designed, developed, installed by Irsah inDesigns with no attribution or acknowledgement back to Irsah inDesigns, holding license/permission with customized send order e-mail template.